Several workshops were recently held to discuss the future of Michigan and Grand River Avenues in Lansing, East Lansing, and Meridian Township, Michigan. 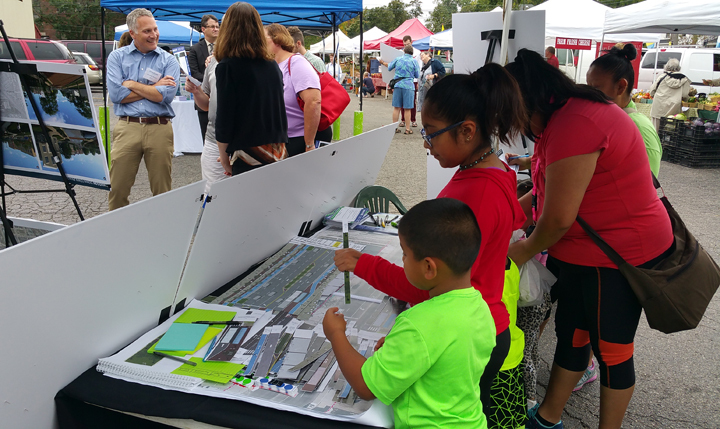 Shaping the Avenue, a planning project managed by the Capital Area Transportation (CATA), sets a course for the Michigan/Grand River Avenue corridor to become a more vibrant, cohesive, pedestrian-friendly, and transit-oriented community main street. MKSK is part of a multidiscipline project team to assist with the public and stakeholder workshops and to develop streetscape design concepts. Residents and stakeholders who participated in the workshops offered their ideas for consideration as part of the final plan. An interactive kit-of-parts public engagement tool allowed participants to “build” their ideal streetscape. Transit amenities, bike sharing, protected bike lanes, parklets, public art sculptures, and sustainable storm water management systems are a few of the developments in consideration. Senior Associate, MKSK Senior Associate Brad Strader, AICP, PTP; Associate, Matt Leasure, PLA, AICP, LEED AP; and Transportation Planner Lauren Cardoni, LEED Green Associate, listened to residents’ input and concerns and discussed streetscape design alternatives.